But how is Nate supposed to make his dreams come true when he’s stuck in Jankburg, Pennsylvania, where no one (except his best pal Libby) appreciates a good show tune? With Libby’s help, Nate plans a daring overnight escape to New York. There’s an open casting call for E.T. : The Musical, and Nate knows this could be the difference between small-town blues and big-time stardom. Over-The-Top Audacity … in the Best Possible Way! What’s so great about Nate: A voice that’s fresh, funny, with a spot on middle grade. Nate has all the anxieties and self-doubts of any misfit. But what makes him so adorkable is his how he embraces his quirks, and motors right through his fears with improv that’s nothing short of genius. And then there’s Nate and Libby’s swear words, which are as unique as they are endearing. They curse with the titles of (real!) legendary Broadway musical flops, such as Dance of the Vampires. Who knew? Reality with a dash of wacky: The Plan Libby and Nate concoct to get him into the audition in New York City is realistic and level-headed. The amusing flaws in their scheme spring from a ten-year-old’s naive view of the world. Still, things manage to work out for Nate. Like how he talks his way into purchasing a bus ticket—when he’s obviously under age—using his older brother’s ID. His brother Anthony is 16, at least ten inches taller, and has the face of an international model, which Nate so is not. Admittedly, the coverage of a local stabbing on the television monitor in the ticket booth was a saving distraction for the ticket salesperson, what with the gory graphics, eyewitnesses, and a crying woman holding a baseball bat. Still, Nate’s anxiety driven improv is ultimately what does the trick. From there on out, the wackiness spins into high gear… But I’m getting ahead of myself. I’d share more, but I don’t want to ruin it for you. Just be sure to have a box of tissues handy. You’ll need them. I sure did! Home is where the heart is: They say that comedy has to have an element of pathos to make it funny. In Nate’s story, the pathos comes from his disfunctional family. His parents are on the verge of divorce, his all-star brother hides beer in his closet, and then there’s his mother’s estranged sister. The very aunt who comes to Nate’s rescue (thanks to Libby) as a legal guardian, a requirement to get into the audition. The broken dynamics of Nate’s family, and how his wacky adventure helps put them on the mend, makes you care—and root—for Nate all the more. 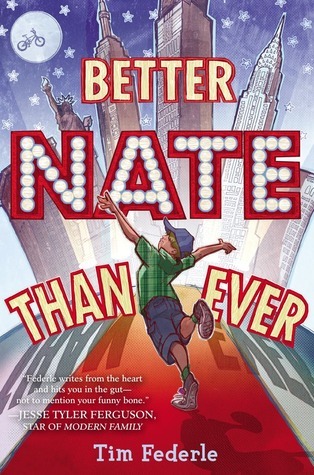 I highly recommend Better Nate Than Ever for most all middle grade boys and girls. Though I’d warn them to keep an eye on their parents. Because they’ll be sneaking this book away to read too.